Bryce-The Guy from My Desktop! 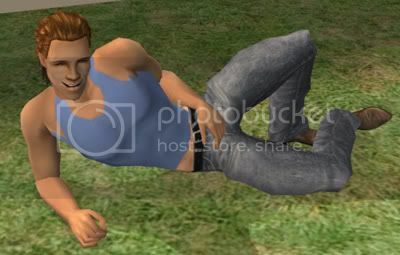 Forum > Sims 2 Community Downloads > Custom Sims > Sim Hunks > Bryce-The Guy from My Desktop! This is my attempt at recreating the semi-clothed guy who lives on my desktop. He is fully clothed here, naturally. I think he came out pretty well. 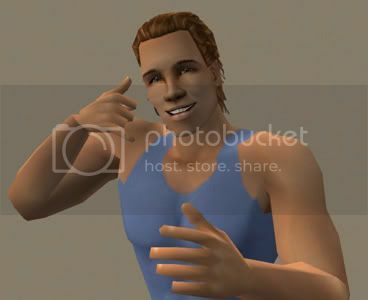 He's one of the few sims I ever made to upload just for the fun of it. I hope you all enjoy. Skintone: Shower-proof Barbie Bodybuilder by Marvine and Beos. Mesh required get it here. Hair: "Gaius" by HystericalParoxysm at MTS2. Mesh required get it here. T-shirt: Recolored by me. Mesh by Marvine here. Jeans: by Marvine and Beos. Mesh required get it here. Eyebrows: by Lella2727. I couldn't figure out where they came from. If anyone knows let me know so I can give proper credit. Thanks to everyone who made the custom content! Holy cow` what a looker. I see he trying to tell me he`s need my phone number! Nice work, I could look at him all day.....wallpaper would be good. Thanks for sharing such a cutie. You forgot to thank Squinge for Hula Dance & More. Any chance of the semi-clothed model.... please *beseeching look* !! thankyou for making my morning! !